Making your mark in a neighbourhood saturated with great restaurants is no easy feat. What, however, does help is having a solid resume like Head chef Victor Liong who opened up Lee Ho Fook in late 2013 with the support of restaurateurs behind MoVida and Pei Modern. 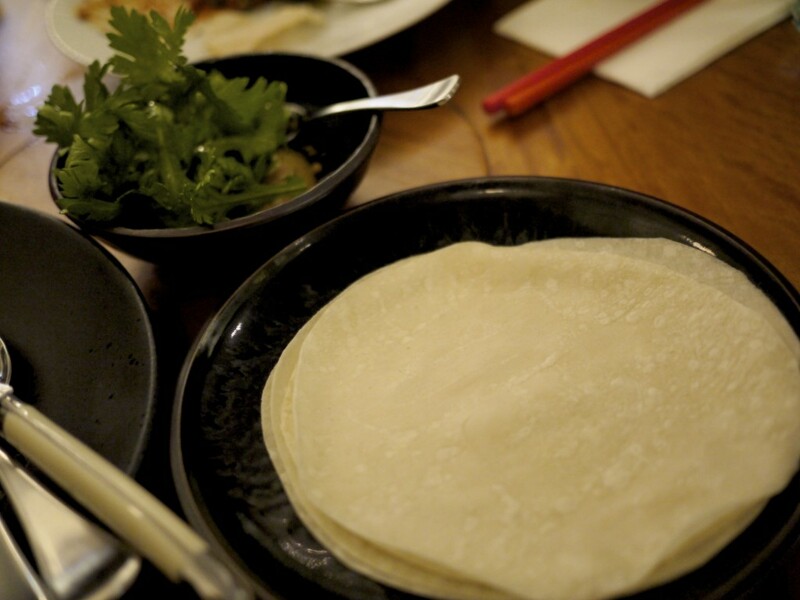 Departing from the euro-centric styled cuisine at Marque where he trained as a chef, Liong has continued to retrace his Chinese root via his short stint at Mr Wong before holding the reins to the latest venture, Lee Ho Fook. Labelled as a neighbourhood eatery, I was curious to see what all the fuss was about when I saw a few articles popping up lately. 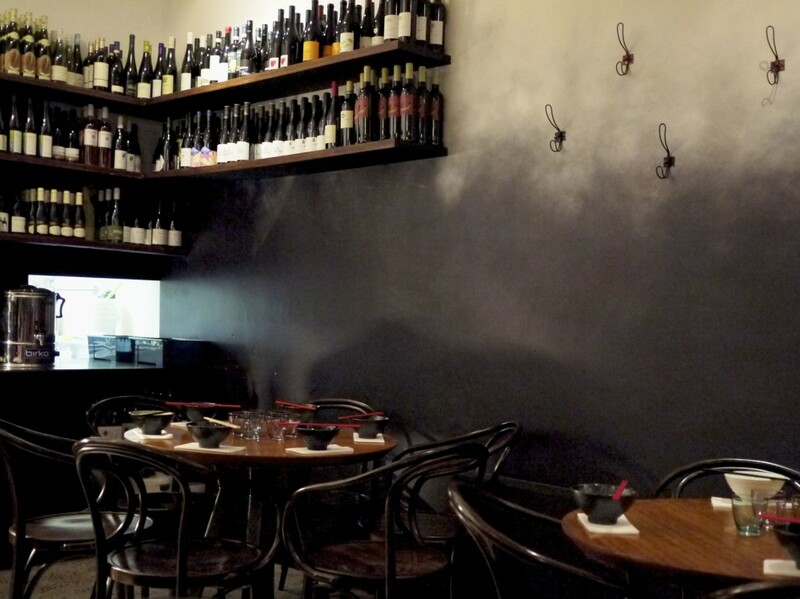 The interior decor was not too dissimilar to what many restaurants have adopted on Smith Street; minimalist with some contemporary lighting design. For a Saturday night we did notice that the place was not at full capacity, but then again that could have been because we were in the first sitting. Yes, the cardinal sin adopted now by many restaurants where you get turfed out before you could finish your after-meal tea despite having forked out over $80 a head!! The menu was simple and broken down into small, medium and large plates. 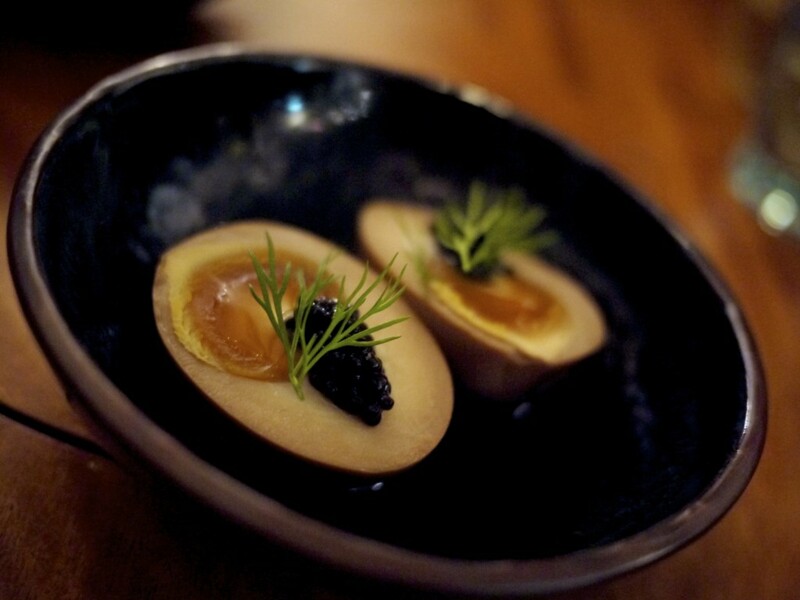 For our small bites we started with the Tea egg avruga and dill. The eggs had been boiled and then cured in a mixture of soy sauce, stock and black tea until the yolk became creamy and jammy. 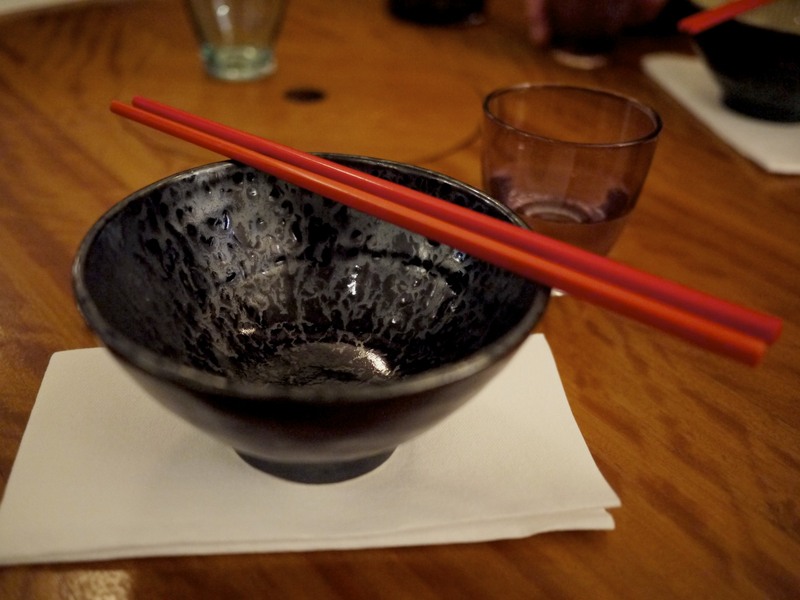 It had a nice umami to it contrasted with the salty avruga, and was one of the more interesting dishes of the evening. 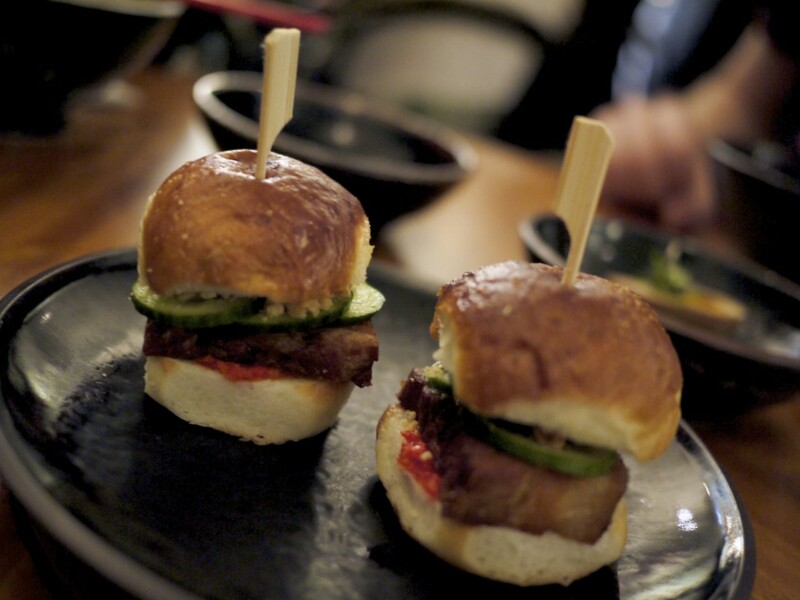 The Milk bun, braised pork belly, salted cucumber, fermented chilli and peanut sugar was strangely not very Chinese looking but certainly tasted so. It was perhaps one notch better than the similar katsu-bun we had at Northern light recently with the difference being the salty cucumber and chilli that gave the dish an interesting flavour. One of the specials of the day was the Crispy chicken ribs and spiced red vinegar. 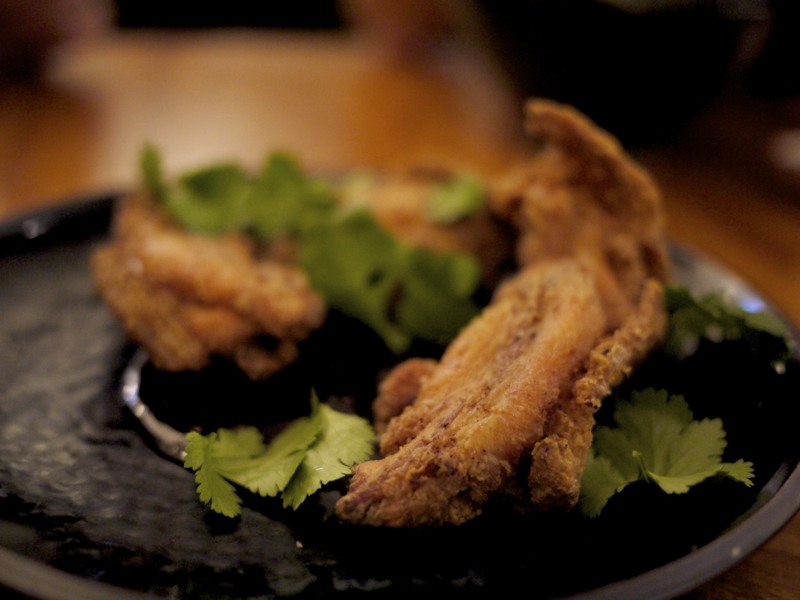 We were not sure of what to expect with tiny poultry ribs but there was plenty of meat to this tender and crispy bird. In fairness though, this was essentially a very simple dish and nothing to get overly excited with. 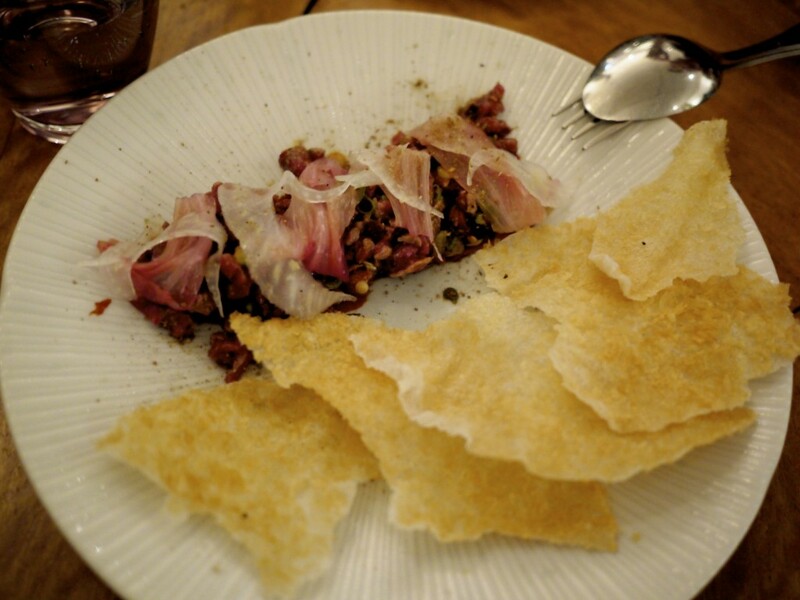 Our medium plates started with Xinjiang style lamb tartare, roasted capsicum, pickled fennel and potato crisp. I found this dish to be rather bland and disappointing on many front. The lamb had very little flavour and the potato crisp was just a tad too oily, not to mention too delicate to scoop the tartare. The only thing that had any substance was the chilli, which dominated the whole dish. An addition of a seasoning component to bring out the flavours could have made this dish rather more appealing. … Valencia orange, chrysanthemum leaves, Peking pancake. While the duck had a nice crispy skin and was soft and succulent on the inside, it rather lacked in depth of flavour. My wife joked that she could not taste the orange at all from this dish. On the contrary, she had not seen what laid beneath the leaves for all I could taste was orange! Furthermore, when you are given essentially only four pancakes between three of you and have no idea on how much orange paste to apply, it’s pretty disappointing to find out on your first bite that the minimal application had in fact ruined the flavour. It would perhaps rather be more appropriate to call this Orange a la Duck? 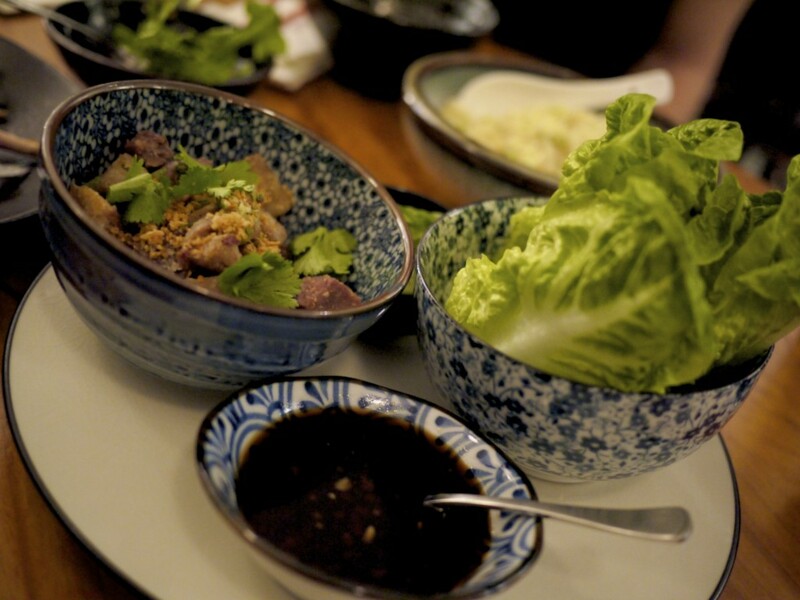 On to our large plate (which were, to be honest, not dramatically different in size than the medium ones) with a slightly better Crispy pork hock, black vinegar, cucumber, baby cos lettuce. 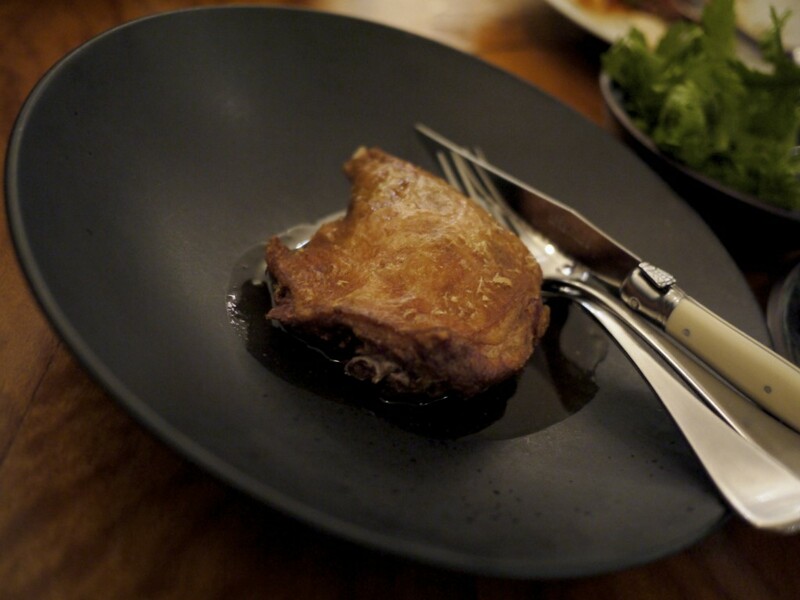 Cube of fatty pork with a crispy layer accompanied with black vinegar sauce. I did however find it rather one dimensional and boring after a couple of mouthful. All you could taste was the dominating black vinegar sauce, which was very salty, although the crunch of the pork was very enjoyable against the fresh lettuce. We opted for some Lee Ho Fook Fried Rice as a side dish to accompany our mains. Whilst it was light and not too oily, it had virtually zero flavour. I also found the rice rather overcooked and too soft, and the absence of a firm texture was a turn off for me. 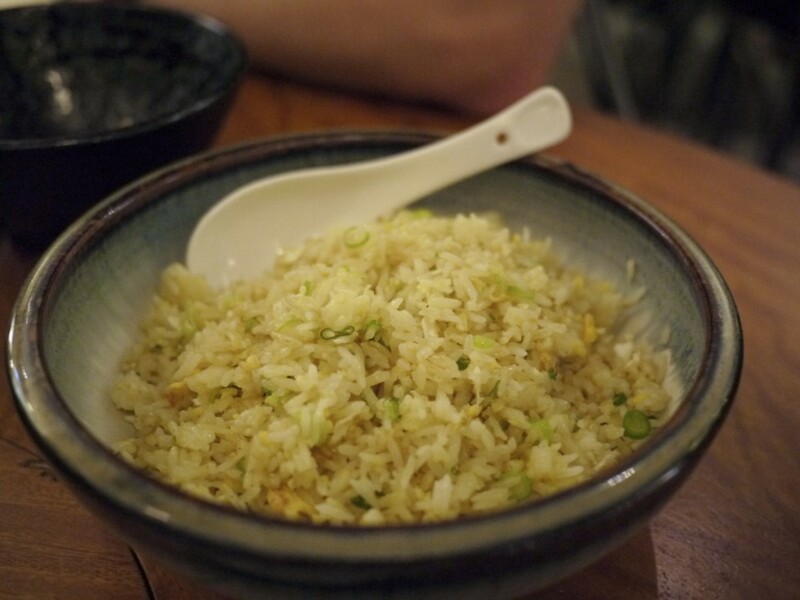 Good fried rice should be made from rice that has been left to dry for a while to reduce its moisture content, giving it that all important bite. Whilst I wouldn’t call this a mush, it was certainly did not fulfil this important requirement. 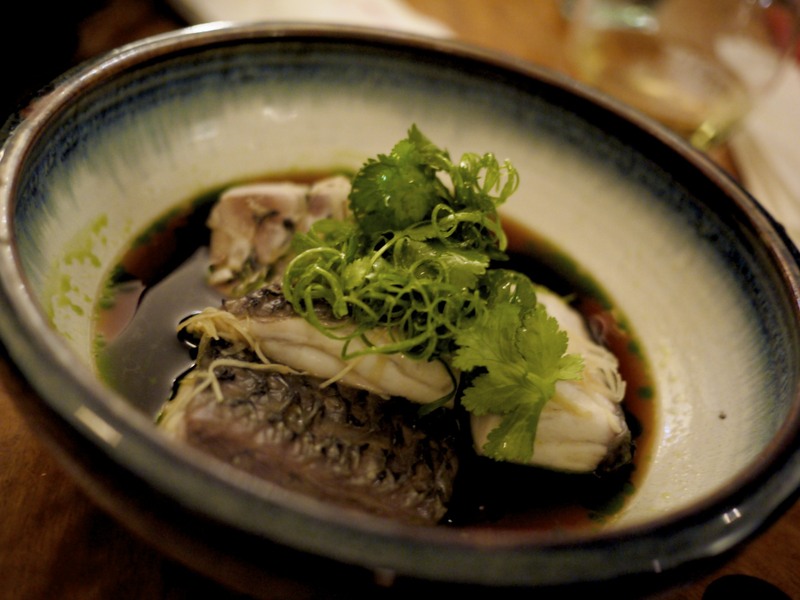 Our favourite course from the medium and large plates was the Steamed Cone Bay barramundi, ginger and shallot sauce. A well balanced sauce and perfectly cooked fish; delicate and the flavour of the fish was very prevalent. We wished there was more. 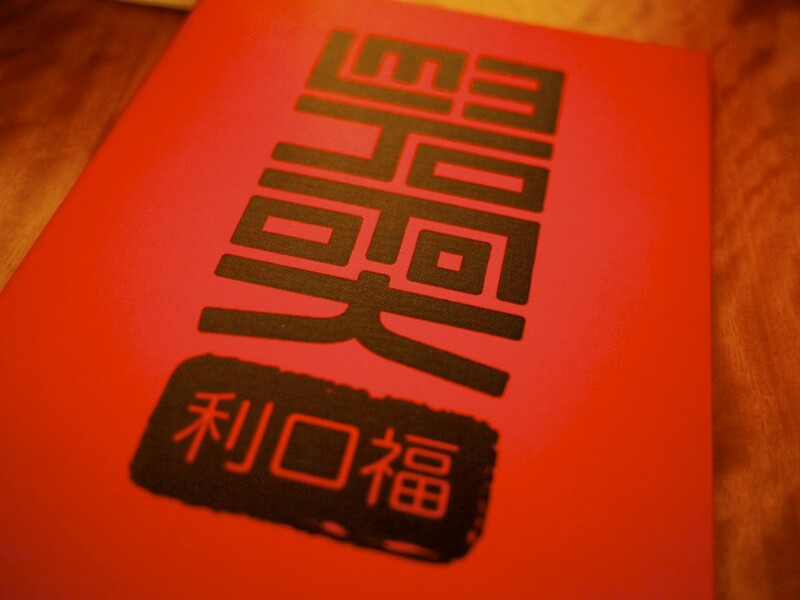 Even in during my time in China I found many top restaurants to struggle coming up with a creative Chinese dessert. Dessert here was rather leaning on the Western style, particularly the Warm chocolate and cocoa nib brownie, Banana cream and coffee. 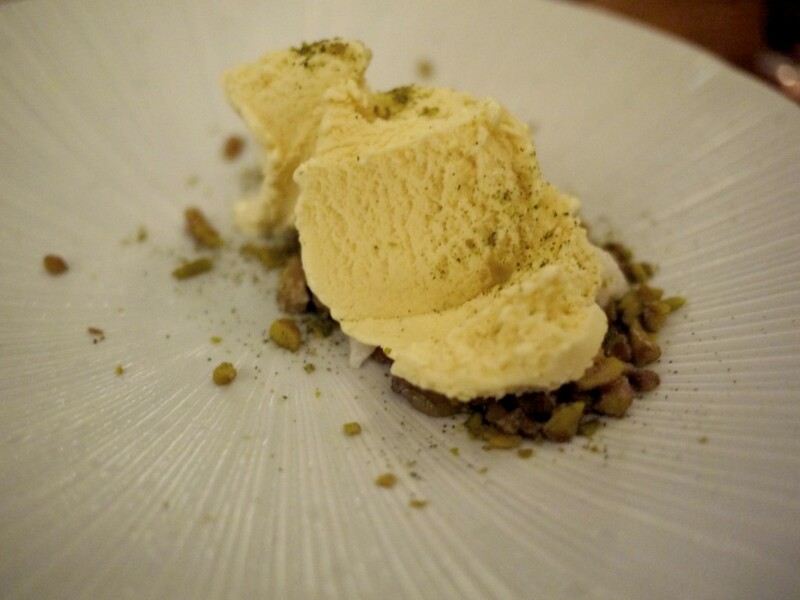 Don’t get me wrong, I thought this was the star dish of the evening. 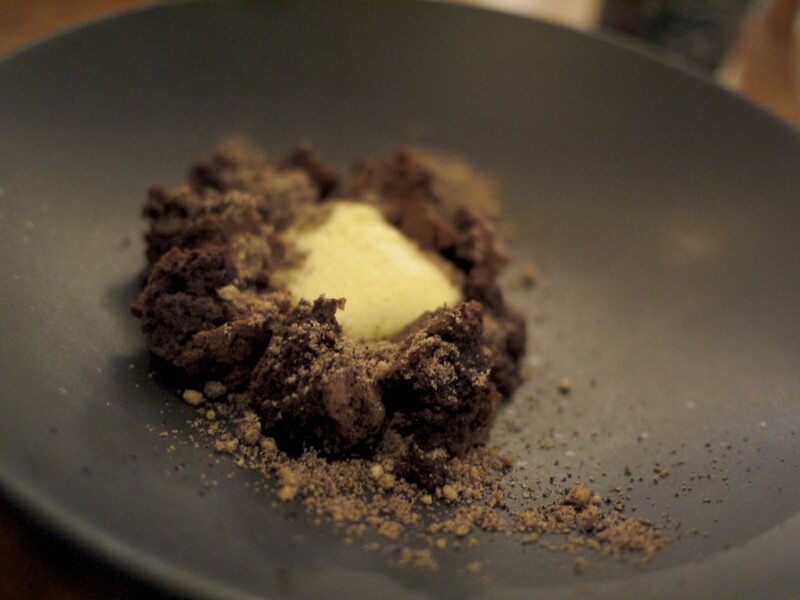 Lovely gooey chocolate encrusted in cocoa nibs and a marriage in heaven with the banana cream. A surprisingly rustic dish which I didn’t expect from a Chinese style restaurant. My wife opted for Our neighbour’s fig leaf ice cream, custard apple, walnut and winter melon jam. Fresh flavours and it wasn’t overly figgy. I had a bite of it and found my palate to be dominated by a green tea / matcha flavour with a slightly bitter after taste. Suffice to say, my wife had food envy with my chocolate delight. As we were just about to pour our mint tea after brewing it for a few minutes, we were encouraged to vacate our table due to the two hour policy. Furthermore, whilst the intention to tip was there as the service was generally good, an assumption was made that the $26 change was in fact a tip (the service was good but not that good! ), requiring us to embarrassingly ask for our due change. Cheeky. Leaving aside the administrative faux pas’, I thought the food in general was nothing special and it would have been fine if the price reflected that calibre of cooking. Sure there were a couple of good dishes but they were nothing to shout about. Top that with a bill that came to the same price bracket as Northern Light next door which was in an entirely different calibre, I seriously doubt the longevity of this restaurant. This entry was posted in Australia and tagged Chinese, Lee Ho Fook, Mark Best, Melbourne, MoVida, Smith Street, Victor Liong on May 25, 2014 by admin.